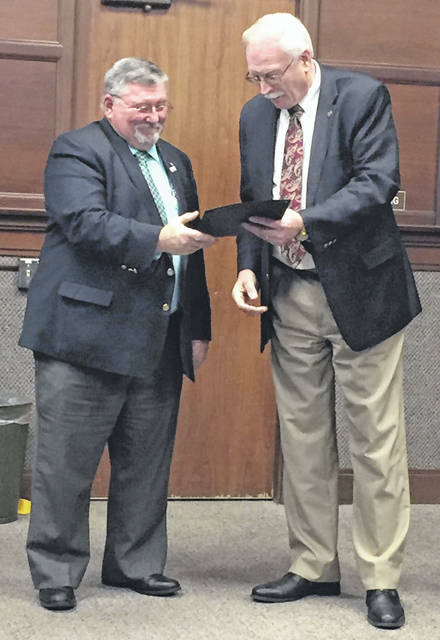 Shelby County Commissioner Bob Guillozet, left, receives a proclamation of April 1, 2019, to be Shelby County Bicentennial Day in Sidney from Mayor Mike Barhorst during Tuesday’s City Council meeting. The proclamation is in recognition of Shelby County’s 200th birthday. David Griffin, director of ABATE, region 6, left, receives a proclamation of May 2019 as Motorcycle Awareness Month in Sidney from Mayor Mike Barhorst during Tuesday’s City Council meeting. 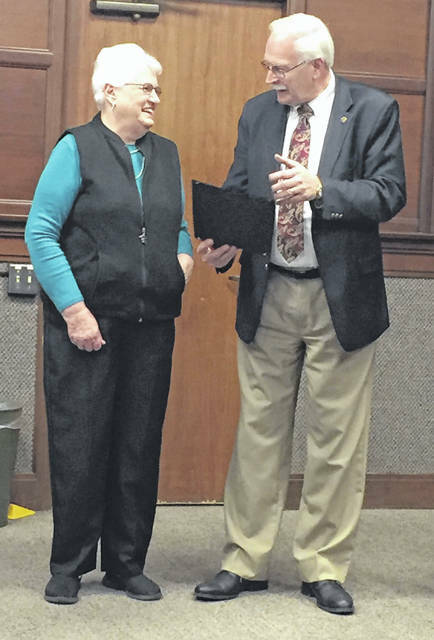 Sidney Tree Board member Anne Sharp receives a proclamation declaring April 26, 2019, as Arbor Day in the city of Sidney from Mayor Mike Barhorst during Tuesday evening’s Sidney Council meeting. 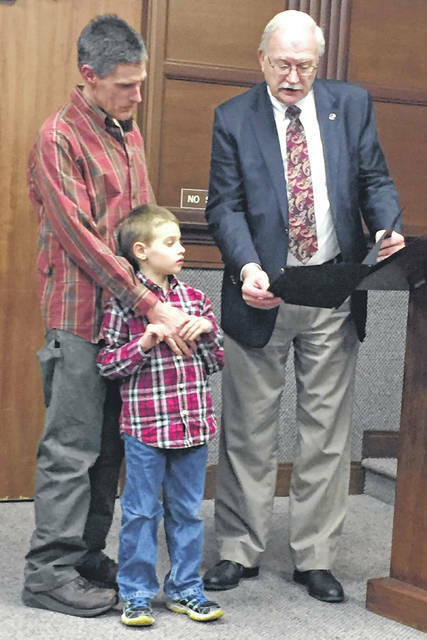 Sidney resident Doug Billenstein and his young son Mike receives a proclamation of Autism Awareness Month and Day in Sidney from Mayor Mike Barhorst during Tuesday’s City Council meeting. Barhorst proclaimed April to be Autism Awareness Month and April 2, 2019, as World Autism Awareness Day in the city of Sidney. SIDNEY — April is officially Autism Awareness Month in the city of Sidney. 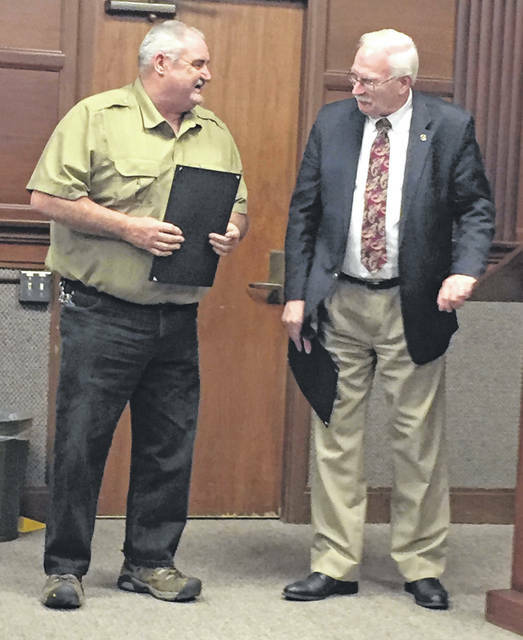 Mayor Mike Barhorst also presented three other proclamations during City Council’s workshop session, Tuesday, to recognize Motorcycle Awareness Month, Shelby County Bicentennial Day and Arbor Day in Sidney. Along with the Autism Awareness Month proclamation, Barhorst included Tuesday, April 2, 2019, as World Autism Awareness Day in Sidney. The proclamation was presented to Sidney resident Doug Billenstein and his young son, Mike, at the beginning of the meeting. Barhorst said the city of Sidney is proud to take part in the annual observance of Autism Awareness Month and World Autism Awareness Day in the hope that it will lead to a better understanding of the disorder. Autism affects 1 in every 37 boys and 1 in every 151 girls. Barhorst said the complex disorder can cause challenges with verbal and nonverbal communication, social interaction and repetitive behaviors. He noted that autism and can effect anyone, regardless of race, ethnicity, gender or socioeconomic background. “Early diagnosis and intervention tailored to individual needs can have lifelong benefits, easing the transition to adulthood and fostering greater independence,” Barhorst said. In accordance, the mayor urged citizens to display blue lights at their homes and businesses, or wear blue, on April 2. The second proclamation Barhorst presented declared May 2019 as Motorcycle Awareness Month in Sidney to David Griffin, director of ABATE, region 6. ABATE of Ohio, Inc. (American Bikers Aimed Toward Education) is a non-profit organization dedicated to preserving the rights, improving the image, and promoting safe operating practices of Ohio motorcyclists. Beginning with the month of May and throughout the year, Barhorst said, all roadway users should unite in the safe sharing of the roadways throughout the state of Ohio and in the city of Sidney. Barhorst urged all Ohio motorcycle organizations, clubs, dealerships, groups and highway safety officials to join ABATE of Ohio, Inc., and for all citizens to get into the habit of looking for motorcycles throughout the year and safely share the road. Griffin thanked the city for the proclamation and said bikers are about to be on the road again soon so ABATE works to educate new riders and the public for everyone’s safety. Barhorst also proclaimed April 1, 2019, to be Shelby County Bicentennial Day in Sidney. He presented the proclamation to Shelby County Commissioner Bob Guillozet in celebration of the county’s 200th birthday. Barhorst encouraged residents to visit the location where James Thatcher, Shelby County’s first settler, set up his first homestead in Shelby County. It is located 8 miles west of Sidney, on Hardin-Houston Road, along Loramie Creek, just west of the Bunker Hill Church. He recommended for residents to visit and ponder on what life may have been like in the 1800s for the earliest settlers, and to learn more about the history of Shelby County by taking part in one or more of the many planned Bicentennial events and activities. The final proclamation Barhorst presented Tuesday was for Arbor Day to be observed on April 26, 2019, in Sidney. He noted the city has been recognized as a Tree City since 1989 and is also a member of Tree City USA. The proclamation was presented to Tree Board member Anne Sharp. In addition, City Manager Mark Cundiff reviewed the upcoming Zoning Board Agenda for Monday, April 15, 2019, and the prospective City Council Agenda items for the next 30 days. There will be no Planning Commission meeting in April, he said, as nothing is on the agenda to be considered. Members of council agreed to cancel the City Council workshop session, for Monday, July 1, as nothing is on the agenda, Cundiff said. Council also went into an executive session to discuss pending or imminent court action. Council took no action was taken after the meeting.